REVIEW – Jeans are without question a staple item in the wardrobes of millions of folks the world over. Paired with the right items, they can be dressed up or down and can be worn for work, leisure, or anything in between. 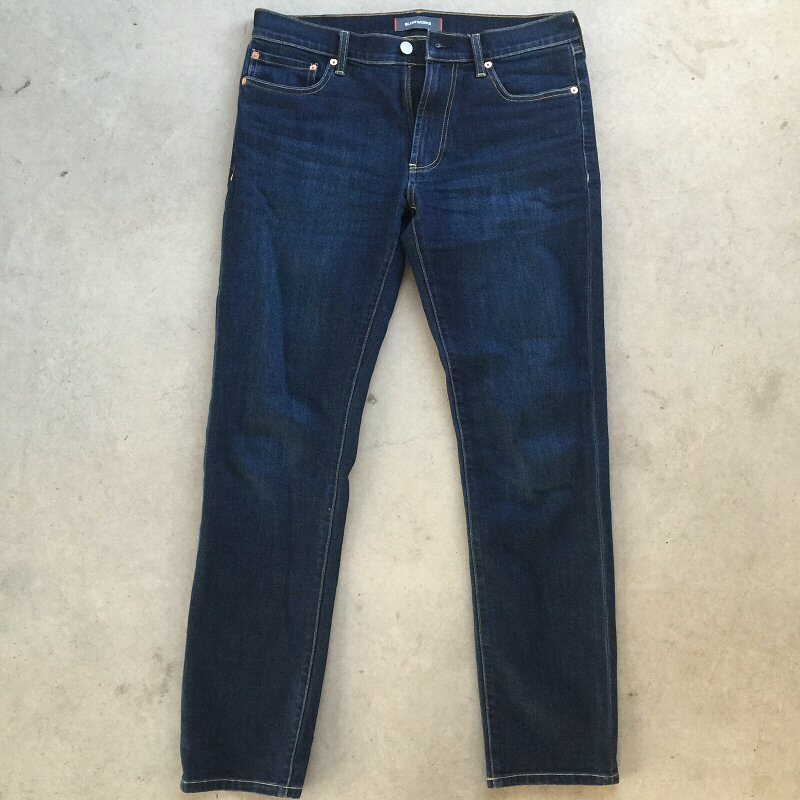 I’d been looking for a new pair of jeans, ones that would not only fit me well and look good of course, which are table stakes in the jeasn game, but also that would be comfortable and include some features that would make them better for travel than standard blue jeans. As someone who respects Bluffworks’ steadily-expanding and ever-impressive clothing product line, I was quite excited to discover that they’d be launching a new product, their Departure Travel Jeans. Let’s take a look! 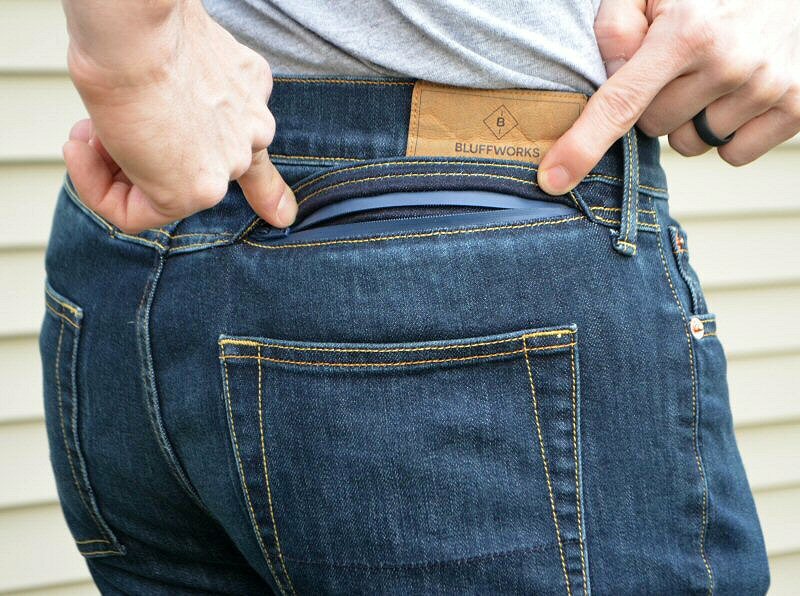 The Bluffworks Departure Travel Jeans are blue jeans made from denim fabric that has been enhanced with high-tech fibers that provide more comfort and include hidden features for travel security all while maintaining the look of classic denim. Bluffworks Departure Travel Jeans arrived packaged in a Bluffworks logo box (not shown) and inside a sealed plastic bag. The bag has a couple of standard labels with product and lot info, and an interesting third label with an attention-grabbing “”HOLD ON!” at top. 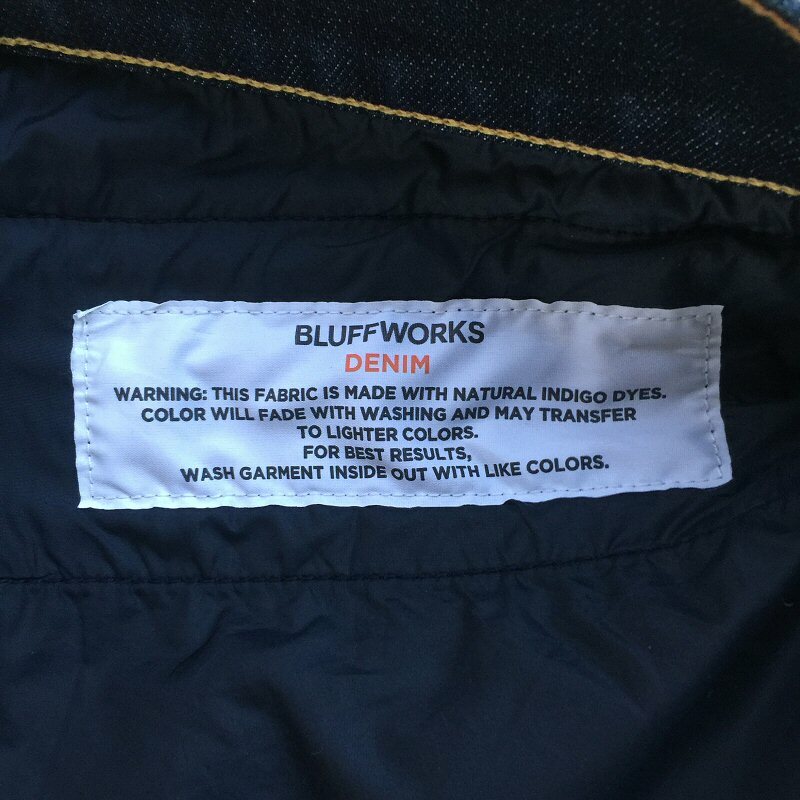 This label explains that the Departure Travel Jeans’ fabric has been made from natural indigo dye and gives a suggestions on initial washing. More detail on this below. 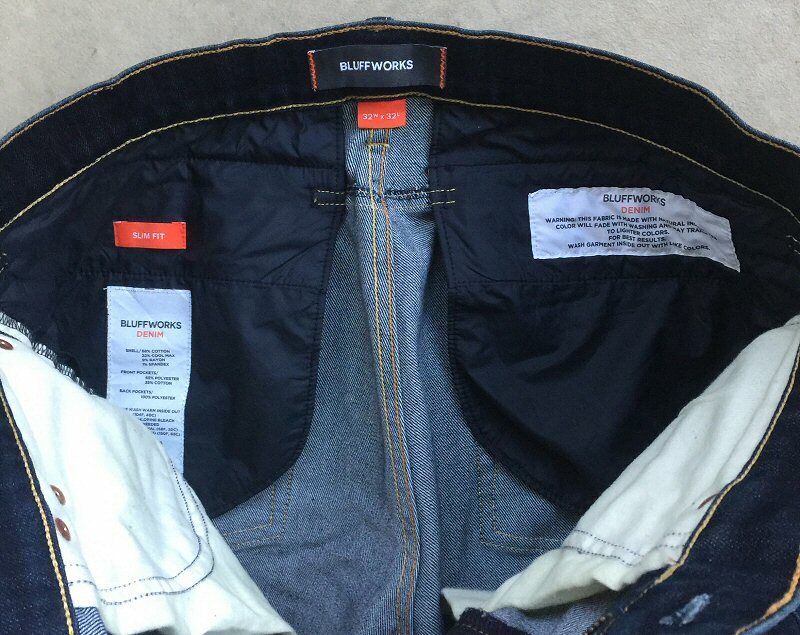 Upon removing them from the bag, my immediate impressions of the Bluffworks Departure Travel Jeans were twofold: they felt very soft, not stiff in the least, like they were a freshly out of the washer and dryer, and also they felt very lightweight. I also noticed their color, which was a very deep, indigo blue. The Departure Jeans have the look of classic, traditional denim blue jeans and in fact have a simple, minimalist design that has avoided the addition of excess decorative features. I like this for two reasons. First, I don’t care for all the excess artistic ornamentations that have made their way into the styling of jeans; I prefer a more low-key style and actually think that most people do as well. Second, considering that the Departure Jeans have been purpose-built for travel, having a more low-key style seems better in keeping a low profile while traveling, when avoiding unwanted attention would often be preferred. 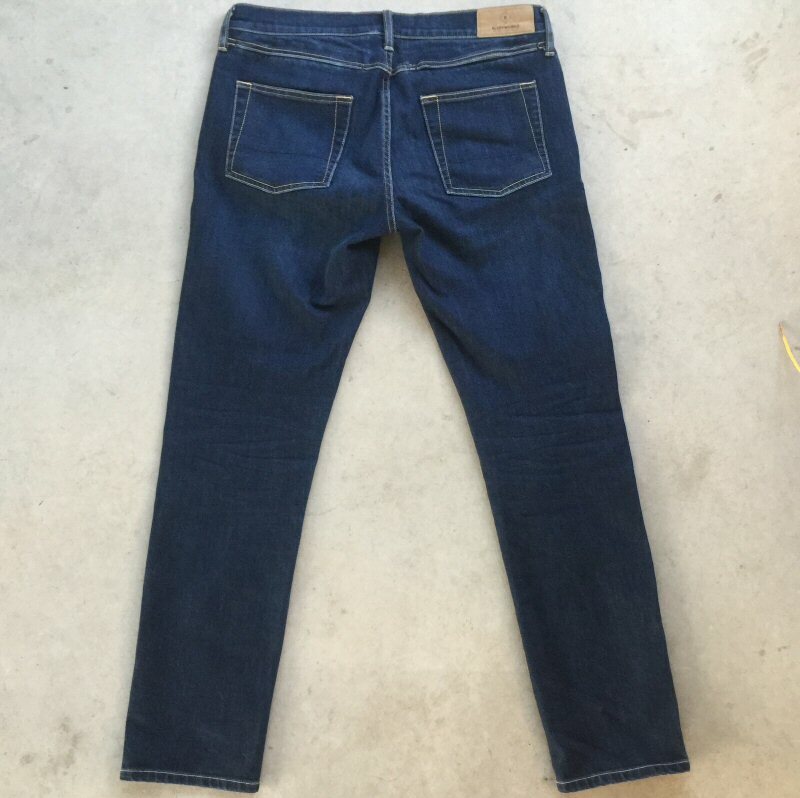 While the Departure Jeans are a very deep blue, indigo color, then are not completely, 100% dark blue all over; they have had a light factory wash such that a few areas have very slight fade, which gives them just a touch of character but without going overboard on fading as with many jeans. I really appreciated this about the Departure Jeans, because it gives the wearer the ability to dress them up or down, depending on the situation. In addition, their color can take on varied appearances based on the type of light in which they are seen, as evidenced by the photos in this review, which were taken in various lighting conditions. While the Departure Jeans do have a low-key style, they are not completely devoid of some subtle yet classy details, like the contrasting yellow and orange stitching as seen in these close-up images. 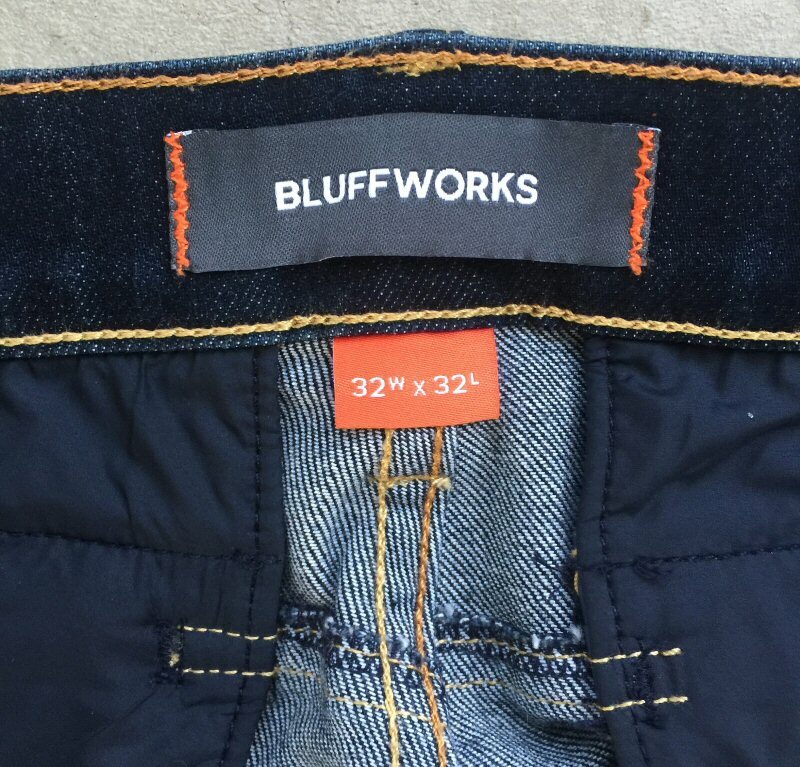 Bluffworks has also sewn a logo tag into the inside waistband of the Departure Jeans, which is another feature I like—their exterior doesn’t have screaming, obnoxious logos everywhere. 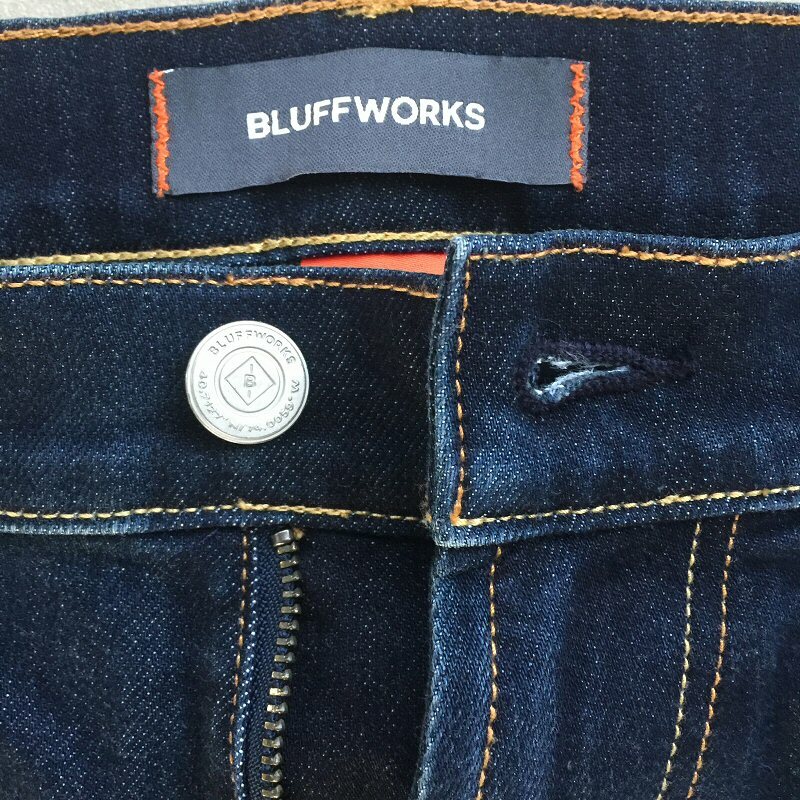 Also, one of the Departure Jeans’ details that you might not catch immediately is the detail on its button, which features the Bluffworks logos and a tiny set of latitude and longitude coordinates which evoke a sense of travel and adventure. These coordinates are a detail you will often find subtly included on Bluffworks’ products if you search carefully for it. I really like little details like this on a product—they are like hidden gems that indicate that the product was designed and built with attention to detail in mind. And speaking of exterior logos, there are only two, the first being a leather tag stitched into the rear waistband of the right side of the Departure Jeans. 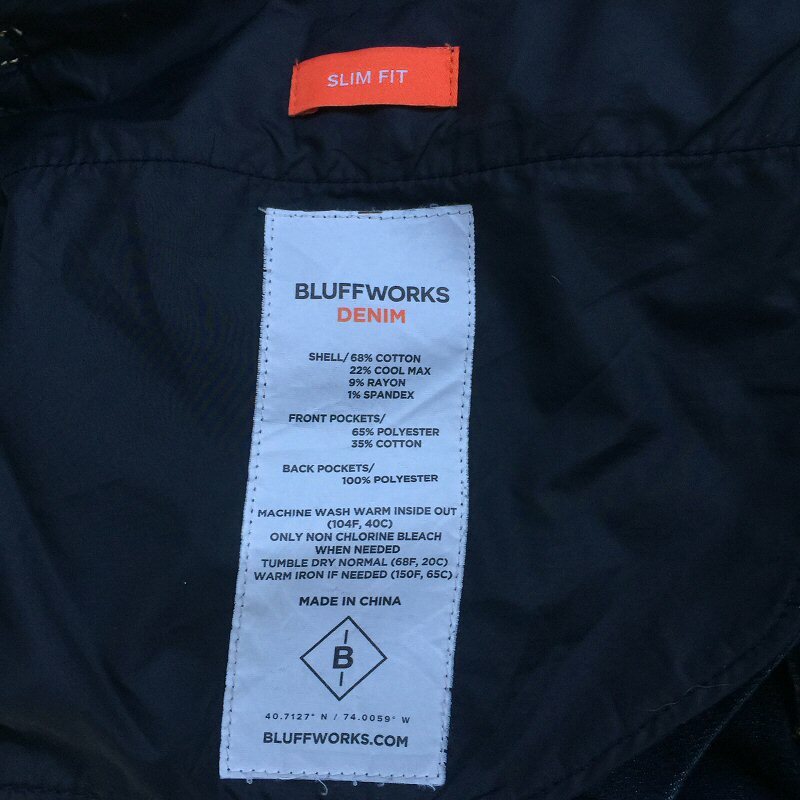 This leather tag shows the Bluffworks logo as on the button shown above, including the latitude and longitude coordinates once again; very subtle yet present. 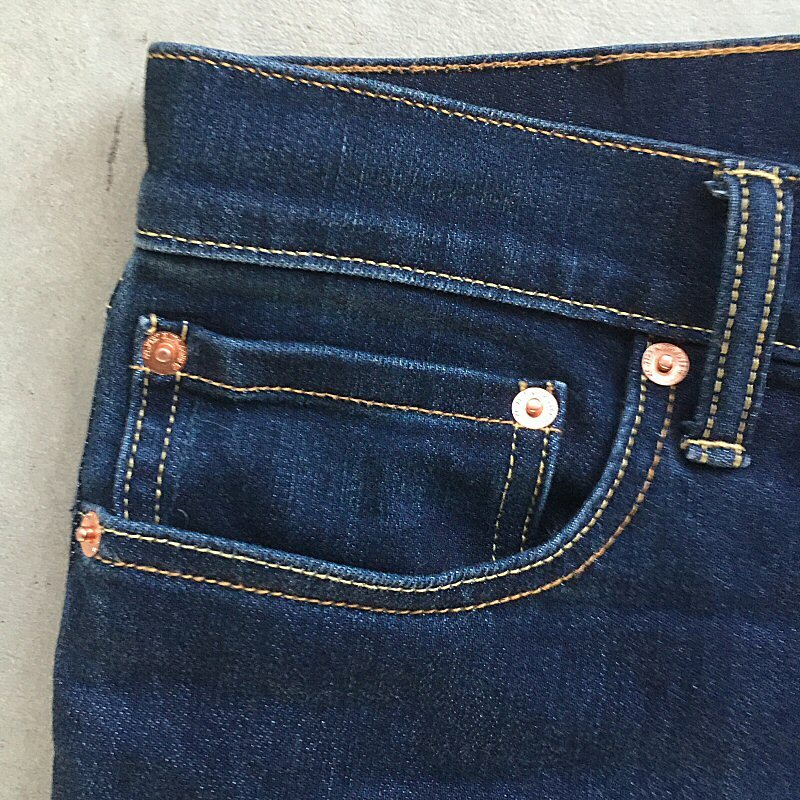 Regarding attention to detail, another feature of the Departure Jeans that is subtle but classic is the brass rivets placed at the intersection of stitching points in higher-stress areas, such as around the pockets as shown in the photo above. As mentioned above, the Departure Jeans are all but completely devoid of excess decorative features, like designs stitched into the pockets, extra thick thread, slick-screening, and so one. In fact, just about the only distinguishing characteristic is a line of dark blue horizontal stitching about 2/3 of the way down the pockets. This stitching is so subtle that I didn’t even notice it at first. Therefore, while the overall look of the Departure Jeans is low-key, yet classic style with attention to the small details, what makes them unique? Two things: first, the fabric’s feel and performance and second, the hidden security features for travel. Let’s talk about the fabric first. The inside back of the Departure Jeans includes a stitched-in tag that indicates similar information to the “HOLD ON!” sticker that was on the bag that the Departure Jeans came in. This tag indicates the fabric’s “natural indigo dyes” and warns that this color will fade with successive washings and that the color may transfer to lighter colors, warning to wash them inside out with like colors. Additionally, I would add that it is always a good practice to wash any clothing, but particularly colored cotton or cotton blends, alone for the first time for this very reason, lest your white dress shirts turn out a pale blue (unless that is your intent of course). 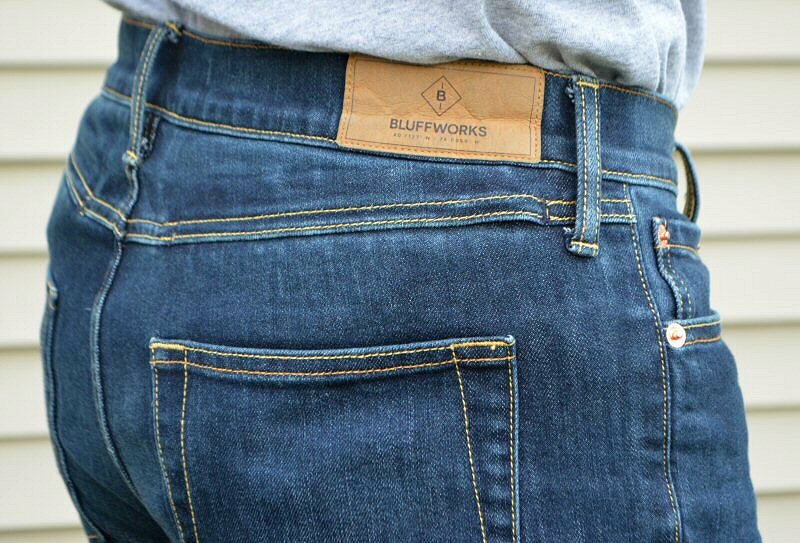 The denim fabric from which the Departure Jeans have been made is still mainly cotton like traditional denim blue jeans, but as with all of Bluffworks’ products, it has been enhanced with some high-tech fibers that give it special properties. The “shell,” or man exterior portion of the Departure Jeans are made from a blend of 68% cotton, 22% Cool Max, 9% Rayon, and 1% Spandex fibers. 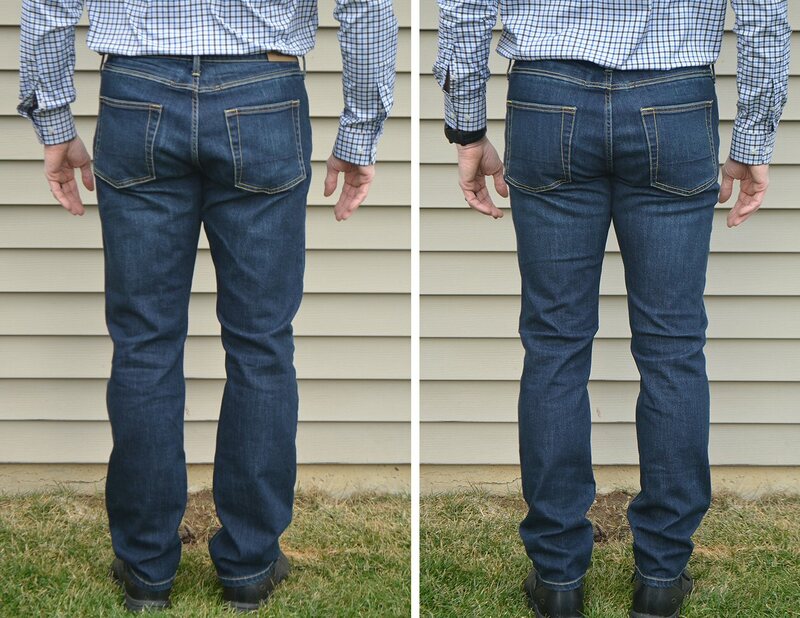 This combination was chosen specifically to give the Departure Jeans added moisture-wicking, breath-ability and stretch. This blended fabric is also 11 oz per fabric yard in weight compared to 14 oz for most standard denim, so they are slightly thinner and lighter than most other jeans, which make them great for travel—they weight less and take up less space in your luggage. The fabric is also fully machine-washable. And, as mentioned above, they are soft. Like, way soft. Right out of the package, they felt soft, and I can say unequivocally that from the moment I first tried on the Departure Jeans, they were the softest denim jeans I had ever worn. Period. Further, as I wore them, their slight stretch and breath-ability combined with lighter fabric weight made them a dream to wear. They just feel good. Really good. 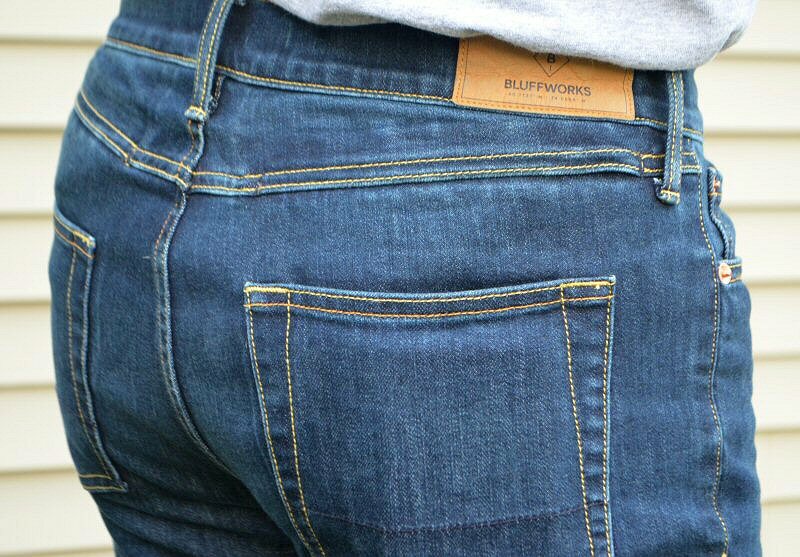 I have to state that one of the things that made me hesitant about reviewing the Bluffworks Departure Jeans was that I have found it challenging to buy jeans online without actually trying on several sizes and styles in a store before settling on ones that I am happy with, and I was concerned that the Departure Jeans would not fit me as well as I would like, which would negatively affect my opinions about the jeans for this review. 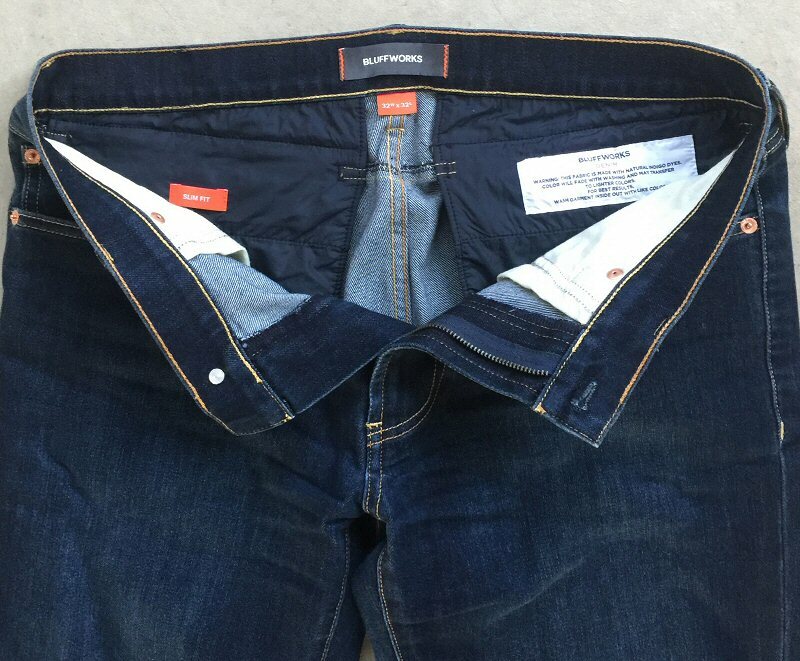 Wary of this, I proceeded with requesting the Departure Jeans in my typical pants size, 32 Waist x 32 Length, and I also requested them in both Slim Fit and Straight Fit, both of which Bluffworks helpfully provided. On me, the Regular Fit was definitely cut fuller in the hips, thighs and knees, but I also found it to be a bit fuller below the knee. The seat was just a tad snug out of the package, but after wearing them around for a few hours and with the bit of stretch to the fabric, the fabric relaxed a bit and it felt and looked fine. 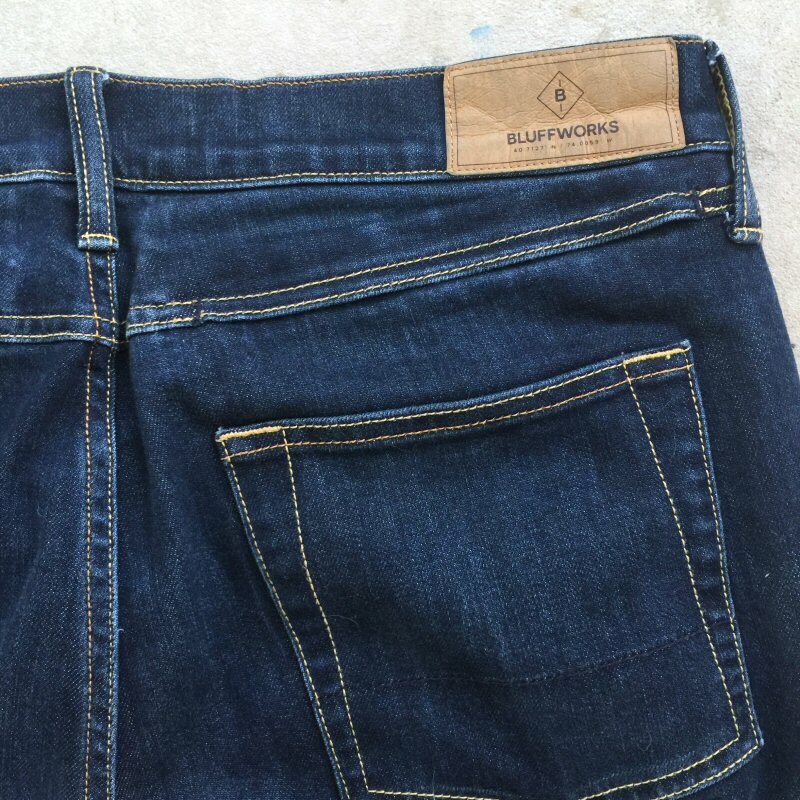 I have tried jeans in both a “regular” or “classic” fit and a “slim” fit from other companies, and I’ve never been happy with a “slim fit” until trying the Bluffworks Departure Jeans. The cut is indeed slim, but not like “skinny jeans” slim. The Slim Fit is a bit more form-fitting and with the added stretch to the fabric, they feel really good and look pretty good as well. They passed the Wife Test, which is always the final hurdle for me. 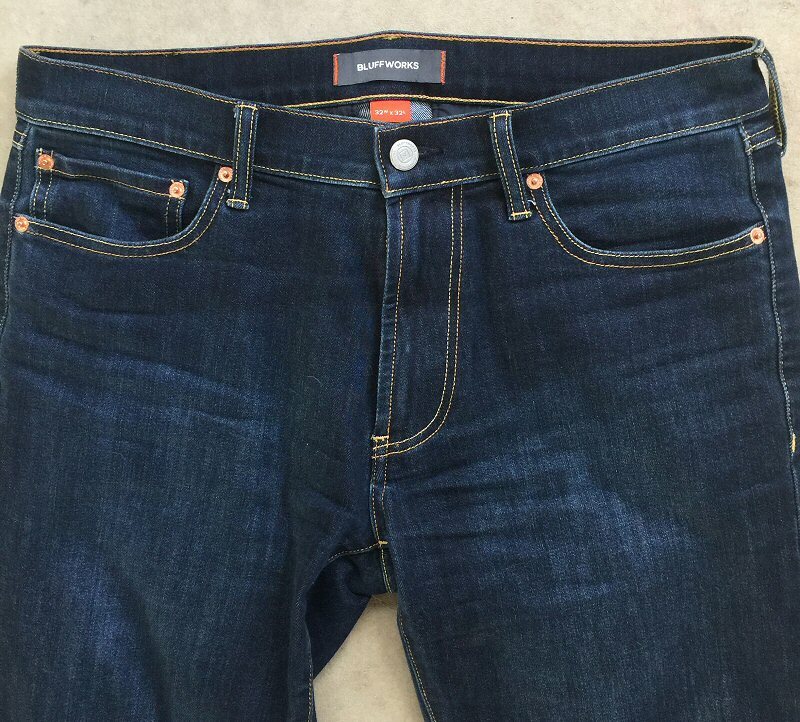 Between the Regular Fit and the Slim Fit, I decided that for the first time ever for a pair of jeans, the Departure Jeans Slim Fit were the cut for me. Nicely done, Bluffworks. 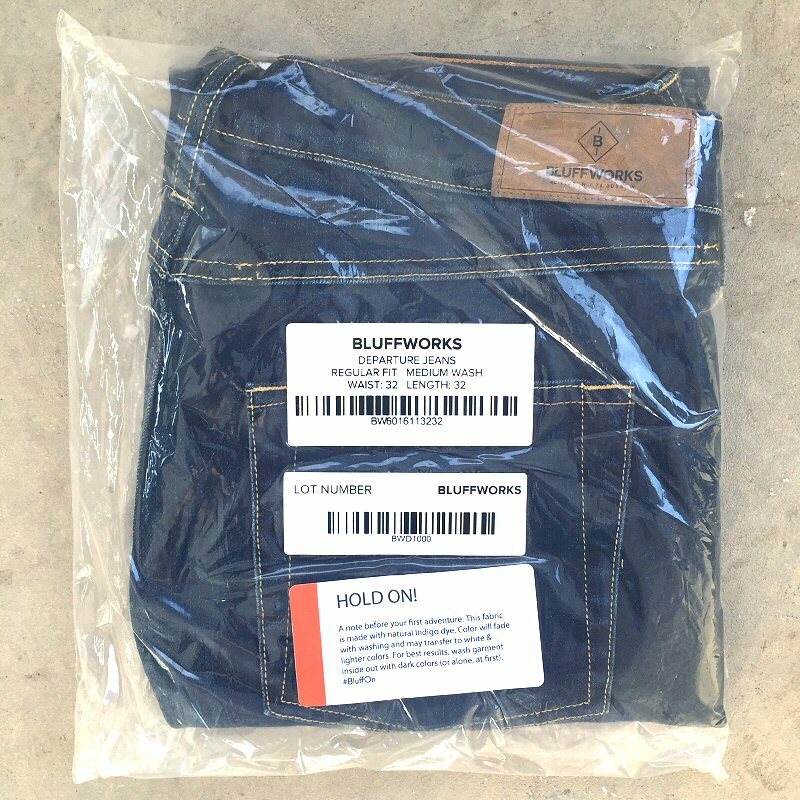 Finally, let’s check out the features designed and built into the Bluffworks Departure Jeans that are intended to aid in security of your items, whether you are traveling abroad or just going to the mall. 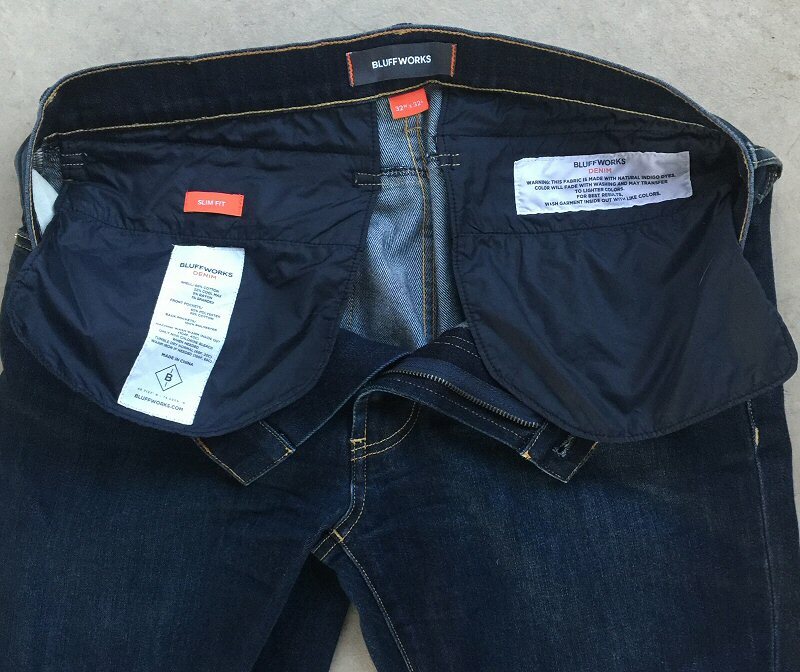 As you can see in the photo above, the back interior of the Departure Jeans appear to have some interesting-looking pockets stitched to and hanging inside. Investigating further, you can see that these pockets are actually quite deep and hang down to the level of the exterior back pockets. 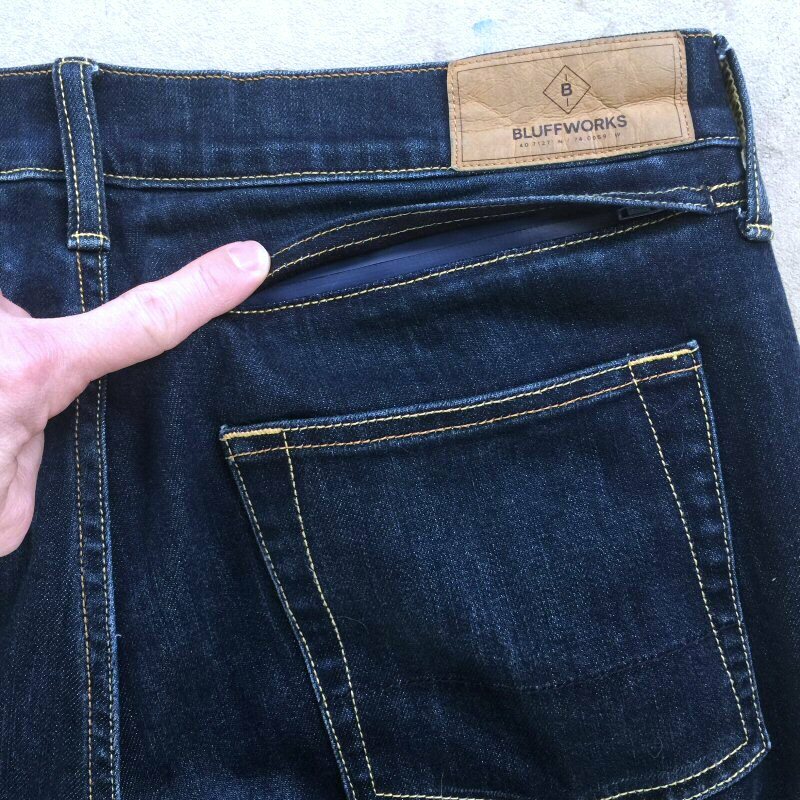 These pockets are made from a thin, very smooth and almost silky-feel 100% Polyester fabric that Bluffworks reports is water-resistant. This thinness and silkiness helped me forget that these pockets were even there while I was wearing the Departure Jeans. 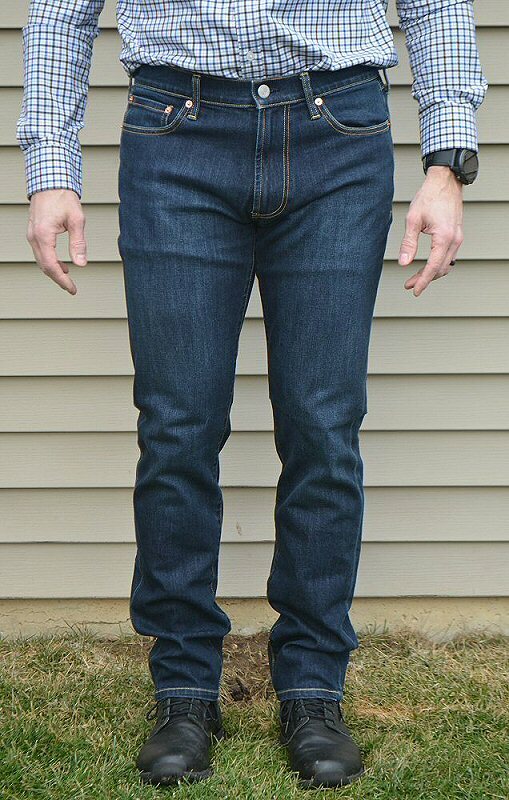 But where are these pockets located when viewed from the outside of the Departure Jeans? This is actually where I think Bluffworks has taken hidden security features to an entirely different plane of achievement: these pockets are virtually invisible from the outside, unless you know exactly where to look for them. Let’s take a look at the right back side of the Departure Jeans, below the leather logo label. 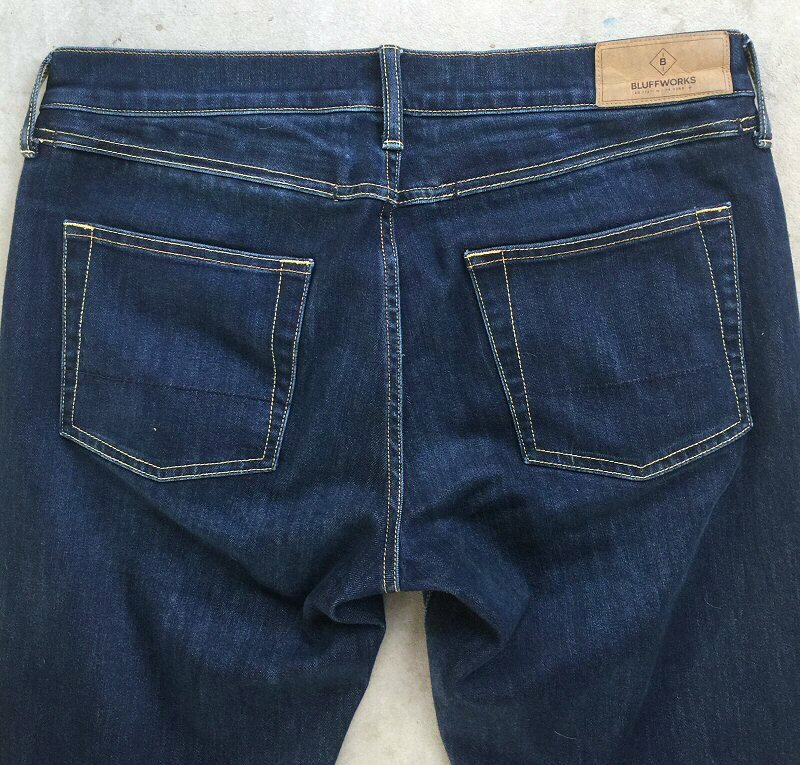 You see the standard exterior back pocket stitched to the outside of the jeans. See anything else? I suspect you probably don’t, or at least shouldn’t. Just beneath the waist band, there is a hidden flap that is camouflaged into the seam itself. This flap is stitched in such a way that in its free state, it lies flat. But if you lift it up, you see a zipper pull perfectly concealed underneath this flap. This zipper is super low profile so that its teeth don’t protrude, plus it has a tiny zipper pull—both are very clever and purposeful features that help prevent the zipper from giving away its position to a would-be pickpocket. 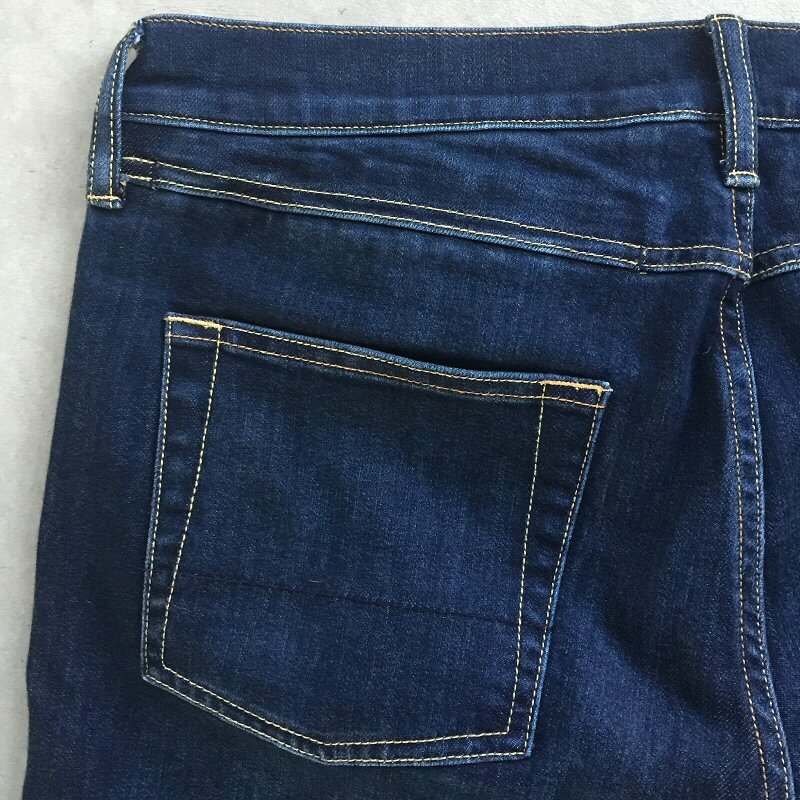 As with the right side of the jeans, this hidden flap and underlying pocket are perfectly camouflaged on the left side of the Departure Jeans also, as seen in the image above. Let’s do one more demonstration of these hidden security pockets. Above, you can just barely detect the presence of the camouflaged seam flap, but only because you have now been trained to spot it. Above, the camouflaged lap has been lifted slightly and the hidden zipper opened. 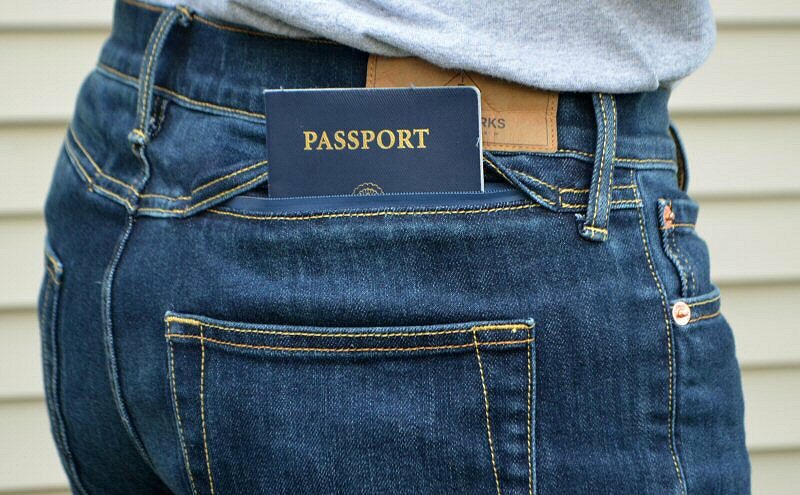 A passport easily fits into one of these hidden pockets with room to spare. Some cash, boarding passes, or other travel documents would easily fit inside as well. Even a wallet would have no problem fitting inside these hidden pockets, although I’d recommend that anything you place in these pockets be fairly slim so as to remain concealed. In the photo above, I have placed my passport inside the hidden pocket and my I have placed my current EDC SlimFold Soft Shell wallet inside the standard outer back pocket. As far as I’m concerned, that passport is undetectable to the casual observer, and further, the camouflage flap and hidden zipper beneath it provide two additional steps that a pickpocket must defeat to actually get their hands on your valuables. 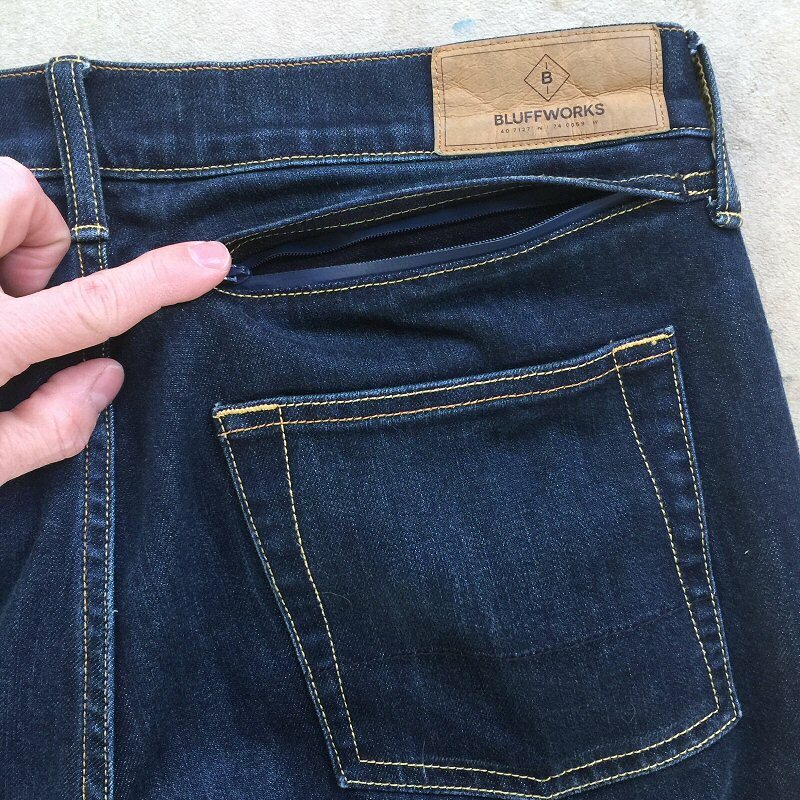 I have investigated hidden security features on other companies’ clothing before, but the way that Bluffworks has integrated these camouflaged flaps with their hidden, waterproof pockets is so well executed, it actually shocked me at first. And I still marvel at it when I wear them and use this feature. 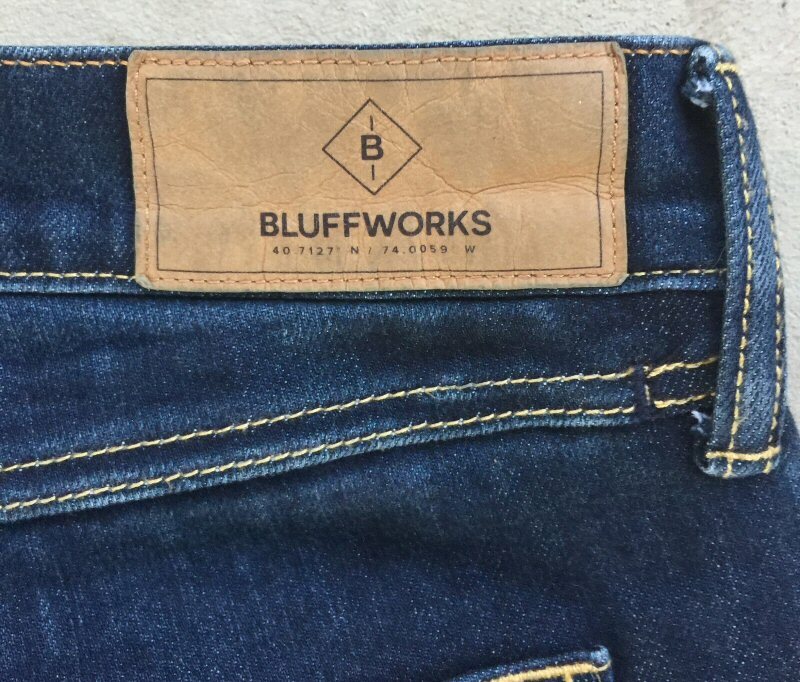 I found the Bluffworks Departure Travel Jeans to be a pleasant surprise when I took them out of the package, and they just continued to impress me from there. Their design is not flashy, but very classy and smart-looking, and can be dressed up or down. 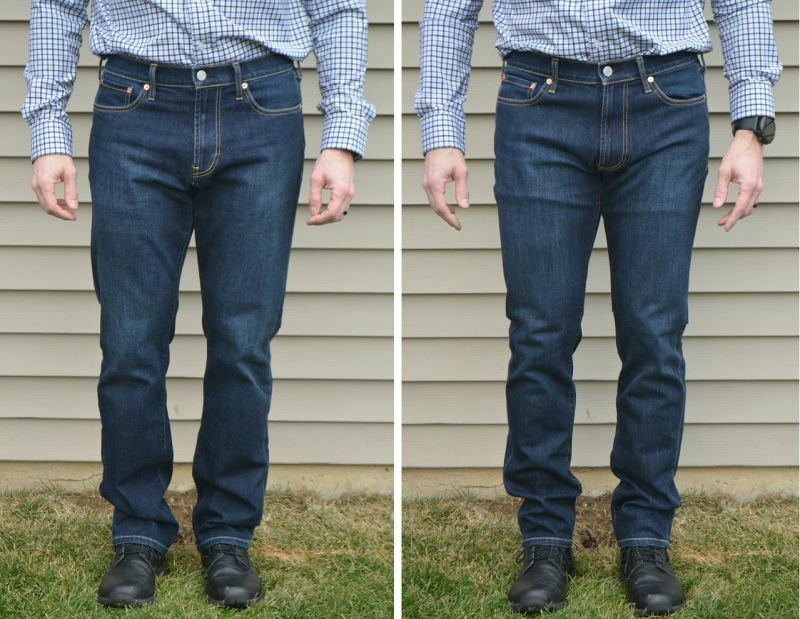 The denim cotton fabric enhanced with high-tech fibers is incredibly soft, has just the right amount of stretch, is thinner and lighter weight than standard denim, and breathes and wicks moisture like a champ—all of which contribute to making the Departure Jeans incredibly comfortable to wear. 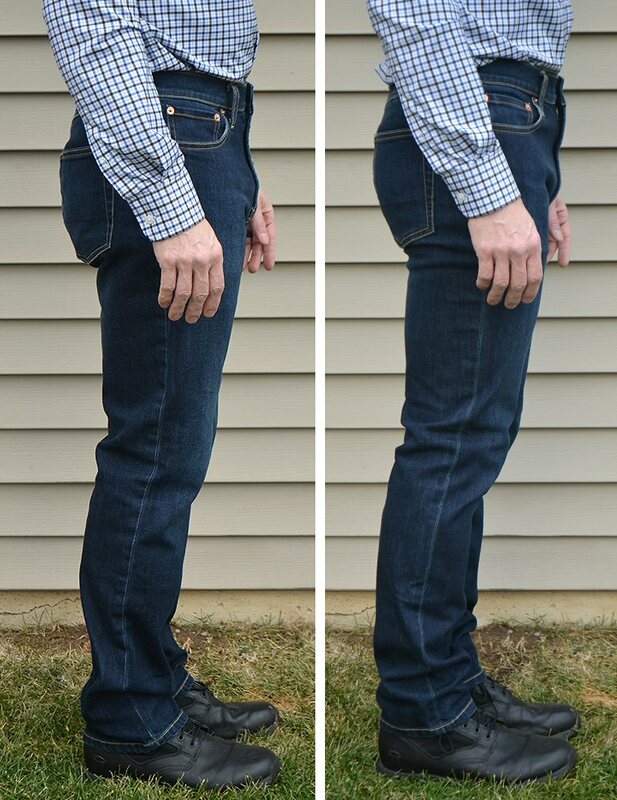 The Regular Fit and Slim Fit both fit as described, which is rare in jeans these days. And finally, the zippered pockets hidden under camouflage seam-flaps were mind-blowingly well done. 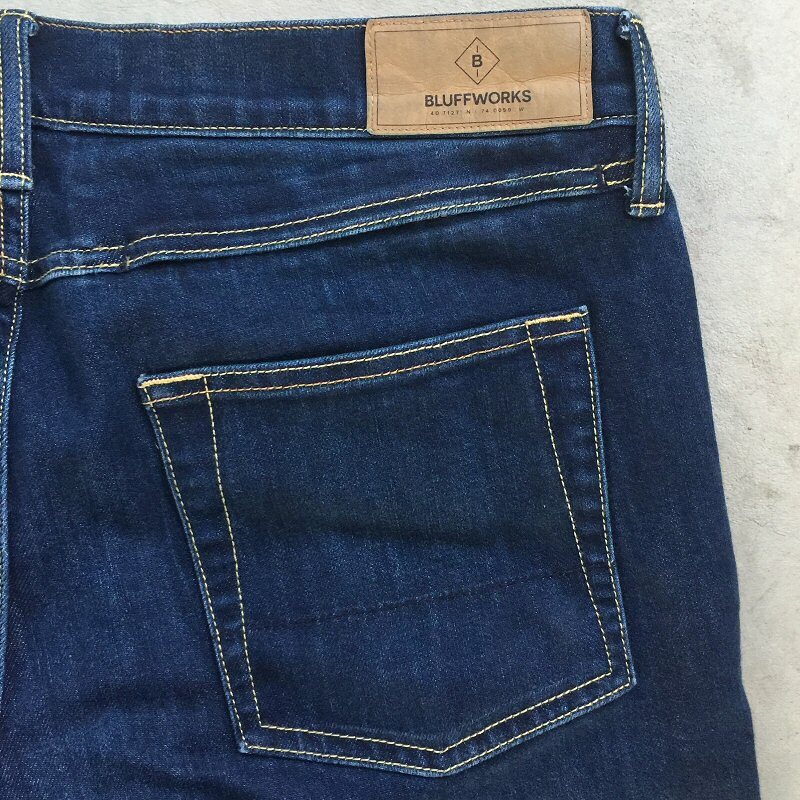 All of these features combined make the Bluffworks Departure Jeans an excellent choice for just about anyone, whether you are a globe-hopping frequent traveler, or plan to wear them to the office, out for dinner, or just want to wear them around town or to hang out, they are well worth their $125 price tag. Source: The product sample for this review was provided by Bluffworks. If one went with slim fit one would have to skip them boxers. 😉 Great detailed review. I gasped at the $125 though. At that price I couldn’t afford to travel. they work fine, but just a little too casual to dress up now. and so i use them for weekends. definately a first pair OF JEANS that I use when I want to wind down, as they feel as comfy as sweatpants at home.